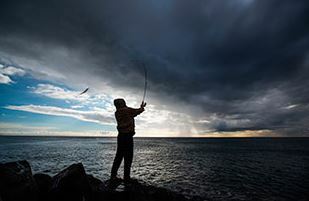 What kind of saltwater conditions call for repeated long distance casting? Surf fishing, especially east coast style, definitely qualifies. The Okuma ALC Mag conventional reel fits the needs of the surf angler and markets to those fishermen. But what about inshore style fishing from the deck of a boat? Anglers don’t need a beefy offshore two-speed reel when in fact, the star drag works wonders. For beginners learning to cast the conventional reel, the cast control feature of the Okuma ALC Mag stands out. The size is right, it concentrates on casting and has ample drag for bassin’ the kelp beds. Product: The Okuma ALC Mag Conventional Saltwater Reel. Overall Ranking: 88 out of 100. 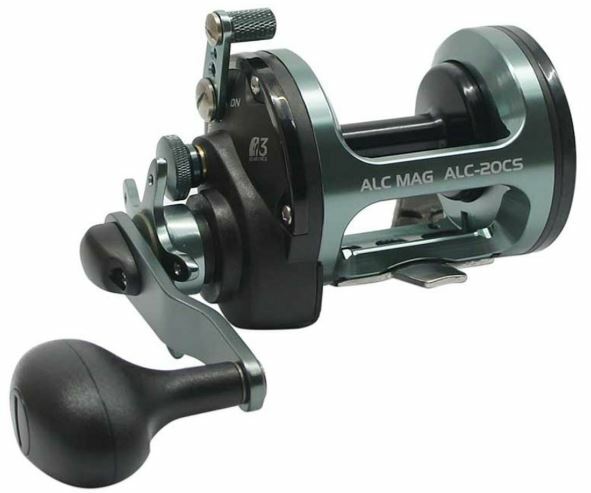 Company/Owner: Okuma Fishing Tackle Corp.
Okuma designates the ALC mag as a surf casting reel. It’s a reel packed with tons of features, many centering around the spool and casting system. At a price that most any angler can afford, the benefits of the Okuma ALC mag don’t stop with its ability to cast. Features such as extra-large gearing in a drop-down gearbox, dual anti-reverse systems, and a strong multi-disc carbonite drag add to the overall value. Should an angler consider the ALC Mag for inshore fishing as well as surf angling? Why not? It certainly has the goods. With only one model to inspect, the specs of the Okuma ALC Mag are very straightforward. It is a size 20 reel as noted in the model number. High grade machined aluminum makes up the frame which connects on each side with graphite side plates. The reel spins on two high-performance bearings and an extra one-way roller bearing makes up part of the dual anti-reverse system. It offers a ratcheting star drag and magnetic cast control system. The Okuma ALC Mag weighs a light 14.55 ounces off the rod and brings a speedy 6.2:1 gear ratio to the table. Cranked all the way down, the star drag puts pressure on the carbonite discs which give 16.5 pounds of maximum resistance. Spools on the Okuma ALC Mag recommend a three size monofilament line range. The light end works for around 230 yards of 15-pound test. Move up to heavier 18-pound mono and wrap about 210 yards or top out at 190 yards of 20-pound test. Okuma chooses quality aluminum material to machine the frames of ALC Mag reels. The result is a reduction in overall weight in tandem with the carbon side plates. Adding to durability, Okuma finishes each aluminum frame with a corrosion resistant coating. One side holds the handle, gearbox, and star drag while the other holds the clicker and cast control adjustment. Both side plates use an injection molded carbon. Light in weight and durable against corrosion, the carbon side plates connect the aluminum frame and close the reel housing. The use of a drop-down gearbox allows Okuma to increase the size of the gears. Adding to the smoothness and durability of the entire gear system, Okuma places a machined brass main gear. Okuma uses their patented Multi-Disc Carbonite Drag System in ALC Mag reels. Though setting the resistance on a star drag comes by feel for the angler, it helps to know the capacity you have to work with. Okuma ALC Mag reels offer a max of 16.5 pounds. Spinning on two bearings to get the job done, Okuma uses nothing but the best in the ALC Mag. HPB as they are known, or high-performance bearings in longhand, stand up to the stress of the ocean. They are shielded bearings which keep out the grit and use quality stainless steel material. The MCS uses magnetic force to control the spinning speed of the spool while casting. Instead of depending solely on the thumb to slow the spool, anglers can set the MCS to control the speed. Generally speaking, an angler still needs to release with their thumb and stop the spool with it again at the end of the cast. Still, the magnetic tabs inside the spool do help to reduce the occurrence of the dreaded backlash. Okuma does like that design of the dual anti-reverse system and they add it to the ALC Mag. Spools won’t fail while they are in gear with both a ratcheting dog and a one-way roller bearing. Like the two HPB’s, the anti-reverse roller bearing is also stainless steel. Instead of using the forging process, Okuma machines the spools. They answer the question of a smooth line surface by finishing off the spool with the anodization process. The result is an effective and durable spool that meets pressures the reel is intended to withstand. 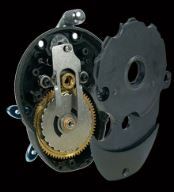 The MSS or Mechanical Stabilizing System follows the same concept of frame support rings. Reels such as the Daiwa Seagate and Okuma Solterra support the frame with metal or aluminum rings. The MSS has the same effect but uses a carbon mold specially designed at different points to support the reel frame. Okuma’s MSS minimizes reel twist under heavy loads which tends to bind up the gears. Okuma ALC Mag reels feature a swept handle which increases leverage while reeling. Handles are quality and anodized aluminum with comfortable Ergo Grip knobs attached. On the handle side of the Okuma ALC Mag is the star which anglers use to set the drag. The star features quality anodized aluminum and turns with a ratcheting system. Anglers will feel the tightening or loosening click which also keeps the star from slipping. 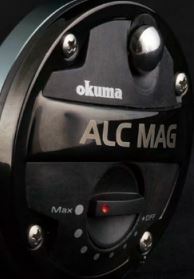 Okuma ALC Mag reels meet the needs of surf casting anglers, whether it be west or east coast striper style fishing. In addition, the idea of taking these reels out and working kelp beds or other inshore destinations is enticing. The biggest features that stand out are both the low cost and cast control system. There are plenty of other features that ensure durability and add to the performance of Okuma ALC Mag reels. These show through in their descriptions and prove themselves on the water. Carbon side plates are an immediate concern. As anglers, we ought to be aware that carbon (aka graphite) keeps the cost down and will not corrode. It’s also important to understand that carbon will become brittle over time. When this happens, it can snap at a weak point. Extended periods of heat or sun do the most damage. Other areas of concern are the drag system and spool. 16.5 pounds of maximum drag is a little on the light side for larger gamefish. Even a large surf hooked striper could put a run on that. In this case, a home guard yellowtail would also stress the reel with 20-pound test. Either more drag or a larger spool seems like a better design. The machined instead of forged spool may also present a weak spot in the reel design. Where Is The Okuma ALC Mag Most Effective? 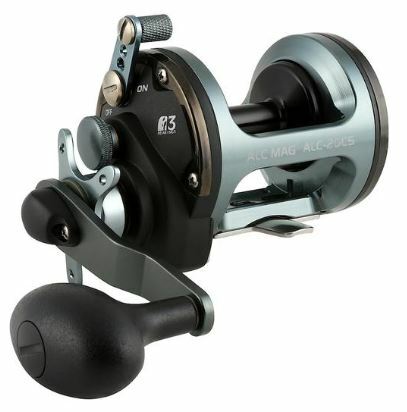 As Okuma intends, ALC Mag reels make the best use on the surf for striper or other similar species. They come with cast control for the repeated casting of spoons or other types of lures. Choose your favorite long surf rod to pair an ALC Mag when using them on the beach. Pair them up with one of the lighter Okuma Pch series rods or a Shimano Teramar Inshore rod for casting on deck. Will the Okuma ALC Mag land a monster striper or shouldered yellowtail? It would be a test but it will be fun to find out! Customers of Okuma products may access the service portal through the main website. With service centers around the world, Okuma takes pride in their products and aims to please every customer. Every Okuma ALC Mag conventional reel comes with a 1-year limited manufacturer’s warranty. While there do exist concerns that keep the Okuma ALC Mag below the 90 ranking, the reel still has a lot of value for the asking price. There are plenty of features and it makes the perfect reel for any beginning angler to practice conventional casting. True jig anglers will eventually want to upgrade to a Penn Fathom or Shimano Trinidad for casting, but the ALC Mag will help in the meantime. They can also be just for a fun little setup on those inshore trips.